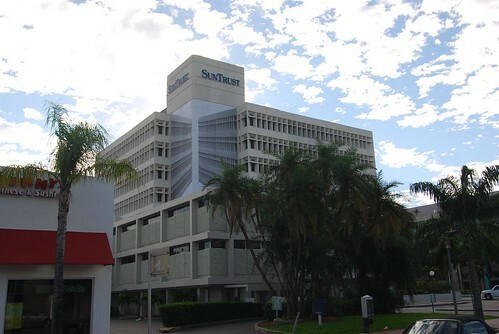 Here’s a better picture of the banner on the SunTrust building at the west end of Lincoln Road. This is somehow related to the coming Herzog & de Meuron project next door. It actually looks perfectly like two buildings from one vantage point as you drive by, but I couldn’t get to it without getting run over. For those who’ve been sleeping, H&dM are also doing the MAM building. I always see that from the gym window. It’s very neat from different angles. It looks like they’re going to plant more trees after they close off the street. That’s a good thing. The site says there will be 4 private homes in the new building … bet that is going to cost a pretty penny. They’re working with a fancy landscape architect on those trees . . . it looks like saltwater pools with mangrove type things? Every time I see that banner I keep thinking how hard would have been to calculate the right angle so that you could see the illusion from the plaza right below the building? The perfect vantage point for the banner as is now seems to be in the middle of Alton Road. Did you see you can download the project animation they have in the website to an ipod? I mean, get over yourselves people. Yeah, the website is lame. No photos, only a crappy video that doesn’t really show the building too well. I think the banner could have been printed that way very easily. But do more people see it from the plaza or from the intersection of 17th and Alton?